The Conventional Rotator is designed to aid the welding of cylindrical vessels. 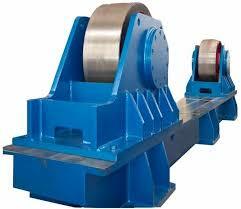 By using independent drive and idler units, vessels of varying lengths can be placed on the rotators supported on the rotator wheels. The wheels can be adjusted on the base frame to accommodate different vessel diameters. There is two type of rotator available one is conventional and another is self alignment. In self alignment wheel takes it’s own position as per diameter of components. So, no need to adjust manually. We can supply base mount, trolley mount and as per need of customer.